It is MORE THAN FAIR for Trump to question the racist Mexican judge hearing his case. 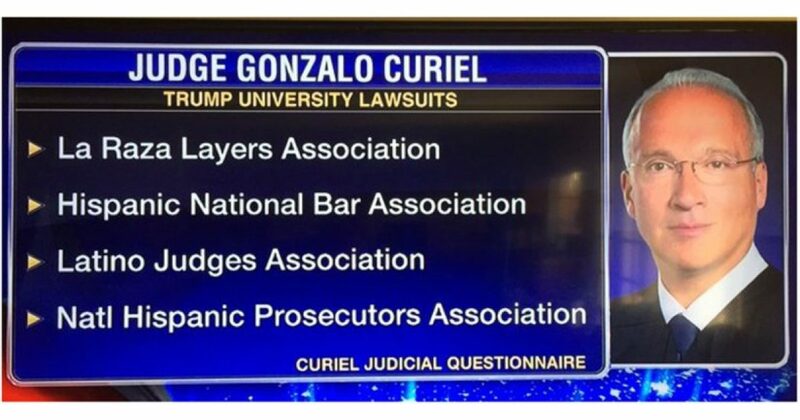 Curiel has distributed scholarships to illegal aliens. He belongs to an organization that sends lawyers to the border to ensure that no illegal aliens’ “human rights” are violated. The name of the organization? The San Diego La Raza Lawyers Association — “La Raza” meaning THE RACE. Let’s pause to imagine the nomination hearings for a white male who belonged to any organization for white people — much less one with the words “THE RACE” in its title. Read Ann’s full article here. Professional sports team in big games painstakingly review the referees. Championship boxers do the same with referees. So what Trump is doing is what any smart person would do. The Mexican judge refused to throw out a frivolous case, because he is a politically motivated Mexican, pretending to be an American. HE is the real racist, and worse yet he’s completely UNAMERICAN! Trump will discover that Mexican Judge Curiel is a member of MS-13, pimps three teenage prostitutes, and is El Chapo’s first cousin. That’s how Mexican, I think Curiel is. And the spineless Republicans need to be publicly flogged. Every time these jellyfish have the chance to do the right thing, they succumb to the political correctness of the Left.